Viewing time: 5 min. 10 sec. The Write Question is a weekly video podcast all about writing. 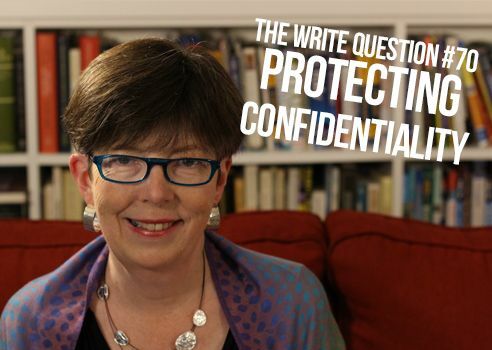 Today’s question focuses on how to protect your book’s confidentiality. If you have a question you’d like me to answer, email me at daphne@publicationcoach.com, tweet me @pubcoach, or leave a message for me at the Skype account, The Write Question. Welcome to The Write Question, I’m Daphne Gray-Grant and my topic is how to protect confidential information in your book. Today, I have a question from Darlene Haber, a writer living in Portland, Maine. Here’s what she’s asked. Thanks for your question, Darlene. An NDA, also known as a confidentiality agreement, is a legal contract between two parties who wish to share information between each other that they don’t want disclosed to third parties. I frequently sign NDAs myself, when I’m working for corporations who need me to see sensitive information, but who want to be sure I’m not going to share it with anyone else. I am never shocked to be presented with one of these and I sign them quickly. You can get NDAs on the internet for free and I provide a link to one below. But let me say that legal advice is worth what you pay for it. So, you might want to get your NDA from a lawyer or a notary public. I’m a big believer in Plain English writing and whenever I’ve had to draw up legal documents with my clients, I’ve insisted that the lawyer write it in as Plain English as possible. Or, I’ve rewritten it myself and then asked the lawyer to review it to make sure it was legally okay. But before you go to too much trouble with your NDAs, let me say that writers are often more concerned about confidentiality than they need to be. Your book is going to feel very important to you but — unless it’s on a wildly popular topic, such as Beyonce or Ben Shaprio— it will be of much more modest interest to most people. Of course, there are some exceptions. I just finished reading Bob Woodward’s 448-page book Fear: Trump in the White House, providing an insiders look at the President. So you can bet that Woodward’s publisher had multiple NDAs with proofreaders, sales people, book designers etc. to make sure that none of the details leaked out before they wanted them to. But that book is on a sensational topic with huge national — even international — interest. And it was written by a famous reporter, at the apex of his career. In its first seven days, the book sold more than 1.1 million copies! The vast majority of books just don’t fall into that category. In fact, most first books are lucky to get a pressrun of 2,000 to 5,000. On the other hand, there are times when casual conversations are overheard in places like restaurants and coffee shops. In September 2017, for example, some of Donald Trump’s lawyers happened to be discussing business at a Washington DC restaurant. They were seated at a table next to one of the New York Times’ most skillful investigative reporters. I’ve provided a link to the fascinating story he wrote, below. You’ve done the research and now you’re doing the writing. You know far more than anyone else about the information in your book and — unlike your proofreaders or copy editors — you know it off the top of your head, which makes you more likely to talk about it. You care about the material in your book. In the case of the US president many other people care, too, but I’m guessing that in terms of your topic, the number of people who care in a deep or profound way is relatively small. So, sure, get your copy editor and proofreader to sign NDAs. Most of them will have done this before and I don’t think they’d be the least bit shocked or reluctant. But the best thing you can do to protect the confidentiality of your book is to keep your own lips zipped, being extra careful about what you say in public places like restaurants and coffee shops. Thanks for the question, Darlene. I think perhaps the most valuable reason for getting NDAs is to give your coauthor some peace of mind. But in terms of real risk, the issue mainly comes down to how you two approach your communications with each other.